Ras el hanout (Arabic: رأس الحانوت‎) is a popular blend of herbs and spices that is used across the Middle East and North Africa. The name means "head of the shop" in Arabic, and refers to a mixture of the best spices a seller has to offer. Left: Ras el hanout from Morocco. There is no definitive set combination of spices that makes up Ras el hanout. Each shop, company, person would have their own secret combination containing over a dozen spices. Typically they would include cardamom, clove, cinnamon, ground chili peppers (also known as paprika), coriander, cumin, nutmeg, peppercorn, and turmeric. Some recipes include over one hundred ingredients, some quite unusual, such as ash berries, chufa, Grains of Paradise, orris root, Monk's pepper, cubebs, dried rosebud, and the potentially toxic belladonna and insects such as the beetle known as Spanish fly. Usually all ingredients are toasted and then ground up together. Individual recipes are often improvised. 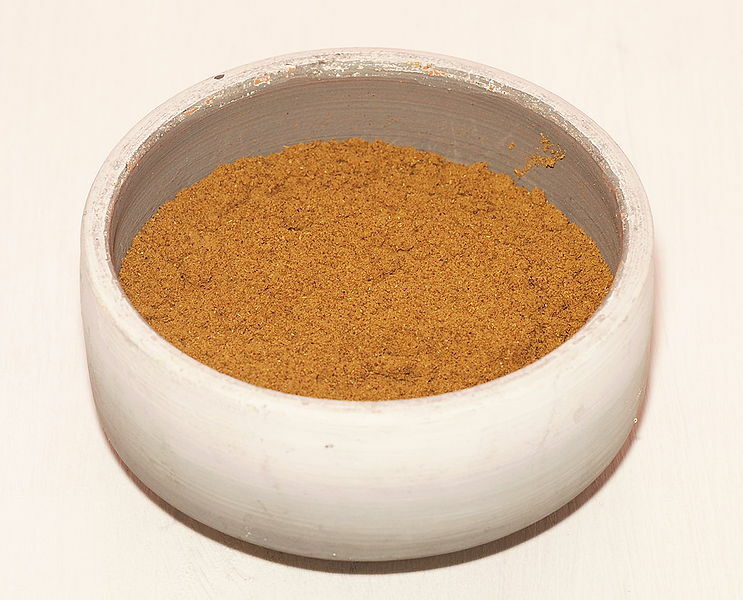 Ras el hanout is used in pastilla (the Moroccan squab/young pigeon and almond pastry), is sometimes rubbed on meats, and stirred into couscous or rice. It is often believed to be an aphrodisiac.